Billingsgate Market is getting into the celebratory spirit by running informative and delicious Festive Breakfasts in the run-up to Christmas. Rachel Walker pays a visit. “I didn’t want to come by myself, because I was a bit worried it’d be full of aggressive traders,” says a food writer to my left. 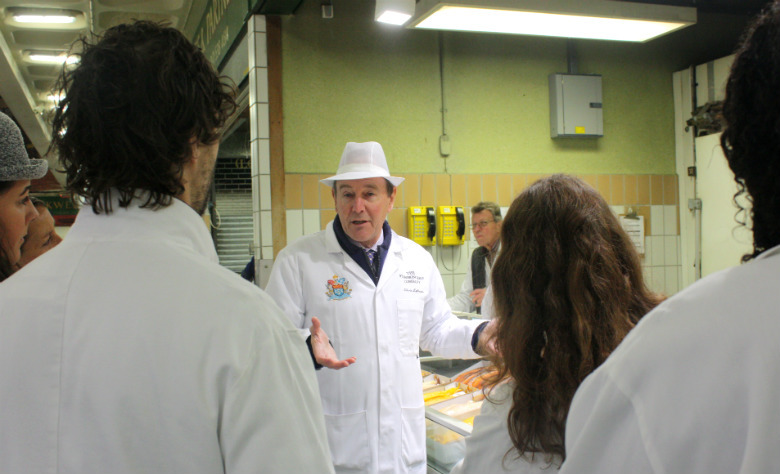 “I had no idea Billingsgate was so close to the city,” confesses another member of the market tour. “I didn’t even realise it was open to the public,” laughs a third. As everyone tucks into hot fish breakfasts at 8am on a wintry Wednesday morning, the consensus in the group is that they couldn’t believe it’d taken them so long to travel to Billingsgate Fish Market, one of London’s oldest institutions. In the six weeks leading up to Christmas, Billingsgate is encouraging more first-timers to visit the market, running Festive Breakfasts until 19 December. 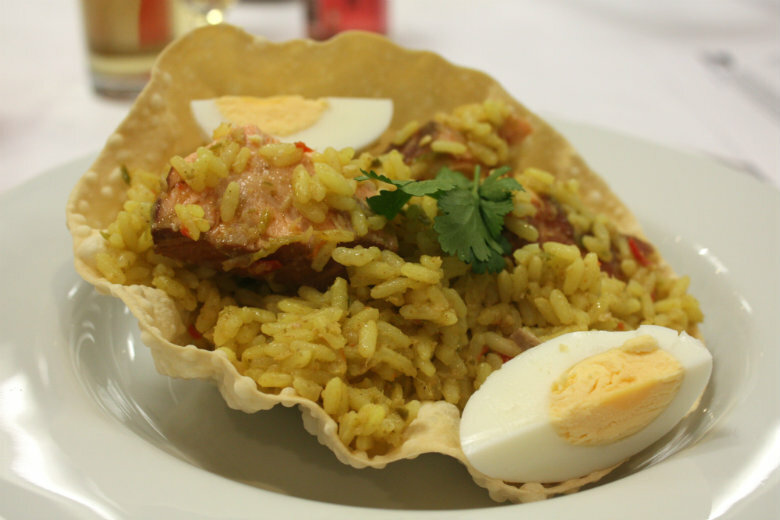 For £45, the morning kicks off with a market tour, followed by a fish cooking demonstration with CJ Jackson, CEO of the Billingsgate Cookery School, and finally a Champagne breakfast with the choice of haddock benedict, hot-smoked salmon kedgeree, kippers on toast, or scrambled eggs with (cold-) smoked salmon. 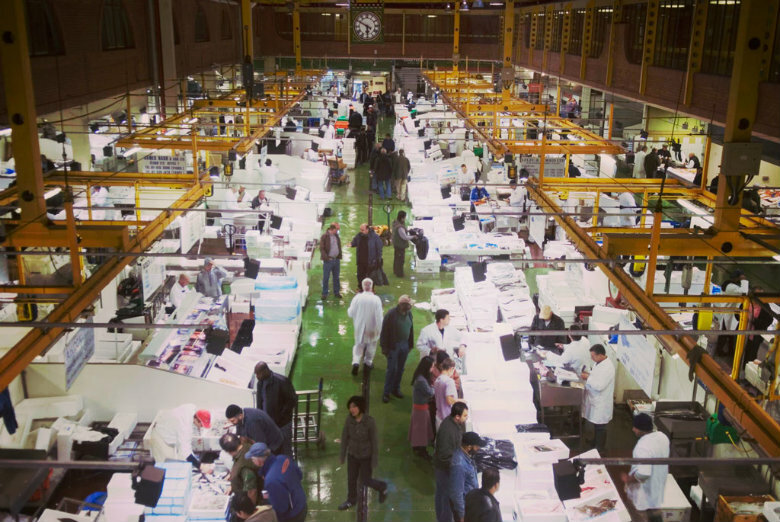 So here we are all are, at 6:45am, congregating at the Billingsgate Cookery School, one level above the market floor, looking out over the fish stalls. Everyone has made it, and the excitement and bustle of the market has already dispelled any bleary eyes. The group is introduced to Chris Leftwich, the market’s chief inspector, and we layer white protective jackets over our scarves and coats, and trample down to the market floor. In Chris’s safe hands, we’re already “on the inside”. As he walks us up and down the market aisles, he smiles and nods at the traders and gently ribs old friends. After all, Leftwich has worked at Billingsgate for almost three decades now, making sure that the fish are always bright-eyed and fresh. He’s a fount of knowledge and the perfect guide to introduce us to all the intricacies of a market that dates back centuries. From the 16th century, Billingsgate sprawled along the river banks by London Bridge. But since moving to its “new” Docklands location in 1982, it’s restricted to a “mere” 13-acre complex. It sees 35,000 tons of seafood pass through it every year. There are about 30 shops around the outside and close to 100 stands in the middle. Wandering around it alone can be overwhelming, but Chris is on hand to talk us through the fish that come from every corner of the globe. “I’ve got a book upstairs this thick,” says Chris, signaling a good few inches with his hands, when we ask him if he can name every species on the market floor. “I refer to it when something comes along that I don’t recognise.” The market stocks fish from more than 150 countries to cater to London’s diverse demands. But it’s hard to imagine Chris ever needing to refer to his book. 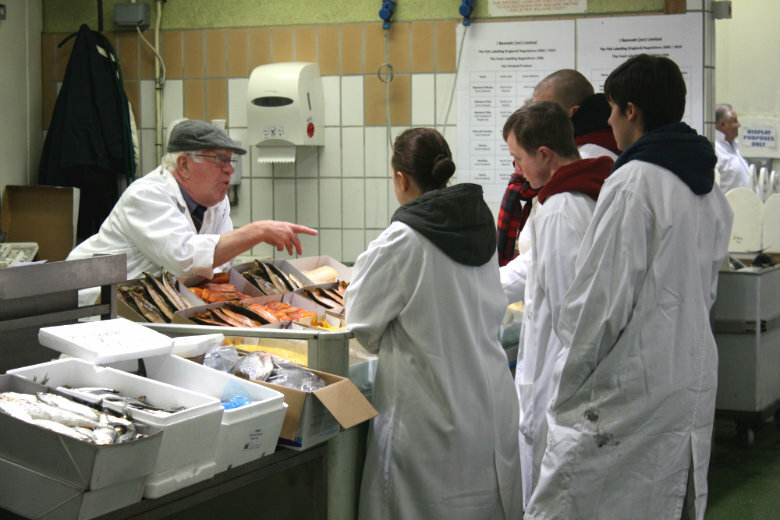 He points out sprats (“the ultimate fast food”), mackerel (“so fresh they’re still pre-rigor mortis”) and frozen packs of catfish (“£3.50 for a kilo: you could stick that in a fish pie and feed a whole family”). And he talks us through all the various types of smoked fish that have travelled south from Grimsby or Arbroath. “This took a bit of a lady’s nose off the other week,” quips one of the market traders as he hands us a dived scallop. “You’re joking, right?” It’s impossible to avoid a bit of the Billingsgate banter and the story’s told with a wink and a nudge, so it’s hard to tell whether it’s fact or fiction. “Honestly!” says Barry O’Toole, another Billingsgate inspector and guide, when we ask him over breakfast. “The woman picked up the scallop and went to sniff it, but it snapped shut on the end of her nose and took the tip off.” We’re still none the wiser as to the truth of the tale, as Barry suppresses the shadow of a smile. After the tour, the group heads back upstairs to the Billingsgate Cookery School, for a glass of Frerejean Frères Champagne and a nibble of smoked salmon on rye bread. Then CJ Jackson runs through some Christmas fish recipes. If anything is going to persuade people to break away from the traditional turkey, then surely it’s her whole-roasted salmon with a buttered sourdough, feta and cranberry crust. She has plenty of other ideas for celebratory dishes (turbot and scallop bisque) and cooking for big groups of friends (Goan seafood laksa). “The key is to be organised,” says CJ. “There’s not much fishing between Christmas and New Year.” Indeed, even Billingsgate is only open for a few hours on Christmas Even and is then shut on Christmas and Boxing Day. The same applies to fishmongers nationwide. But CJ is keen to offer the group as much assistance as possible with their purchases today. No fish preparation is allowed inside the market, but she offers to take any fish bought to one of the catering businesses that have set up on the fringes of the market, so that they can be prepared and packaged to pick up later. By 8am, I’m more than ready for a seafood breakfast – and I’m not the only one. We laugh at the gusto with which we’re all tackling our choice of the hearty dishes on offer, around the time when the first sip of coffee is usually just passing our lips. Heartened by how much we’ve fitted into the day already, we all start to plan our return trips – and our own fish-based Christmas menu that will provide the excuse for our next visit. 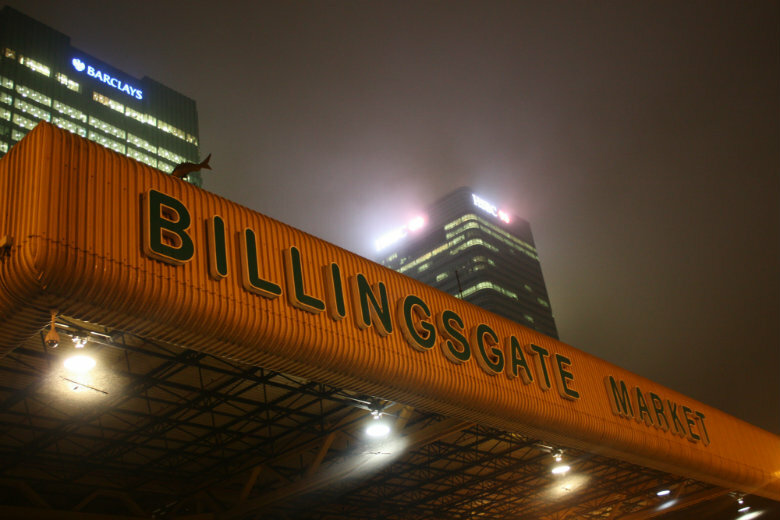 Billingsgate Festive Breakfasts run to Friday, 19 December on Wednesday, Thursday and Friday mornings from 7.45am, £35. Market tours start at 6:45am and are an additional £10. 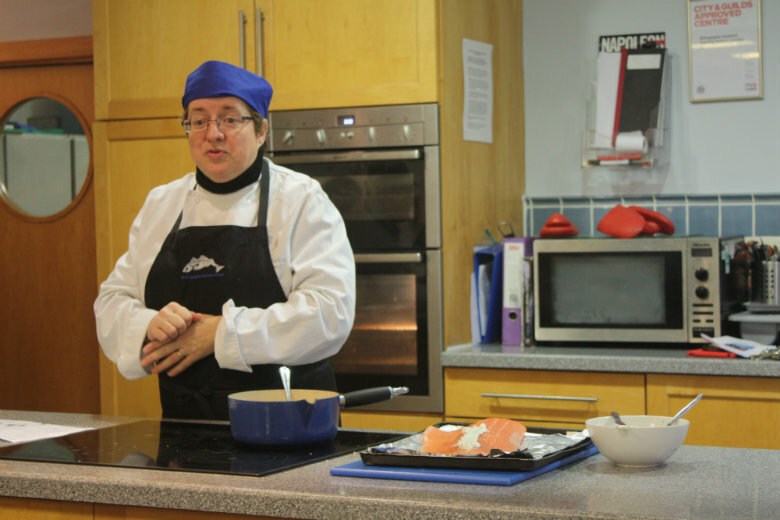 To book, call Kerry on 0207 517 3548 or book online at www.seafoodtraining.org.